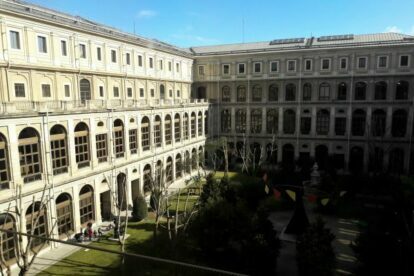 Reina Sofía is one of the most important museums in Spain and is the most important center of modern art in Madrid. Who doesn’t want to enjoy works of art by Pablo Picasso, Salvador Dalí, Juan Gris, Joan Miró or Alexander Calder? And not just paintings; sculptures, drawings, documentaries and short films are on display here. Think about “Guernica” for instance, one of Picasso’s most famous paintings. But beautiful, famous and influential artistic work is not the only reason for me to love it so much. I believe the museum itself is totally worthy of your time because there is a combination of old and new that makes it very charming. The main building, Sabatini, used to be a hospital and its garden is a very special space filled with sculptures by known artists like Joan Miró. This garden is my favorite spot actually. The Nouvel building, which was added to the complex in recent years, is a modern structure where most temporary exhibits are on display. There is also a cool gift shop here, the main cafeteria and a library which is entirely dedicated to books about contemporary art. Also in the old building, Sabatini, there are two crystal elevators that add a modern look to the main entrance. Their opening hours for free entrance are: Mon-Wed/Sat 19:00 – 21:00 and Sundays from 13:30 – 19:00. In the end, make time for the cultural visit but do not miss the charm of the entire place. It will not disappoint.